Nebraska leads the way in prairie conversion to cropland. Farmers are scrambling to drain every last marsh, pond, and lowland, bulldozing shrub and tree borders, anything to squeeze out more money from high commodity prices fueled by ethanol mandates. With crop insurance there's no risk, and taxpayers foot the bill for environmental destruction on a scale larger and more intense than the years leading up to the dust bowl. Grasslands are the most endangered and least protected ecosystem on the planet. Ranchers -- who are often, but not always, better stewards of the land -- can convert to row crops and increase their income many times over; this is happening in South Dakota and Nebraska at record paces as highly erodible lands unfit for farming are converted. This is what stirs my blood, and I see gardening with native prairie plants as essential to both raising awareness of these issues and making a stand (allbeit very miniscule) against the larger forces of a culture we give a free pass to. For the sake of ease and a desire not to be downers, we ignore where our food comes from, what's in it, and what it might be doing to us. We are a nation of twerking cat memes, grown fat on candy-fed beef and high fructose corn syrup. In 2014 I will be a native plant purist because so much is at stake, because so much is being lost not to hosta or daylily or butterfly bush (though I believe those are all junk plants), but to our lunacy. It's my goal to be an Aldo Leopold Jr. to the extreme, yo. Will my wife and I make the leap, find a way to buy an acreage and convert to prairie? Can we start a small nursery, create a display garden featuring only native plants? Will we host weddings, educational classes, and artist residencies down the road? I've put aside a memoir on my family's settling in Oklahoma in the 1890s in favor of researching and outlining a book on the moral and ethical imperative to garden with native plants; hopefully, I can complete this by summer. I've got some great speaking gigs lined up as well as I hope to expand in that area more. We've got our eyes set on Iowa for a move, though nothing is written in stone. Land is more available there, incentives are there for prairie and renewable energy, and there's a niche to fill (I can't tell you how many hundreds of websites I've visited). We'll see. It's crazy. We don't have the money. But it balloons my heart and soul and sets my mind on fire. In my life every big risk I've taken has paid off in phenomenal ways -- going to college 12 hours from home (I am a momma's boy), studying abroad for a semester not knowing a soul, moving even further from home to do a master's degree, moving halfway across the country again to do a PhD. 2014 looks a lot like the word "risk." It feels about time again to feel as alive as I hope to make the landscapes around me. I got really frustrated listening to the folks from Sunken Gardens on the radio today. First, I must admit that I've never enjoyed the Sunken Gardens here in Lincoln -- I do think it's a waste of a fascinating space and of annuals; I'd love to see a native perennial garden that blooms from April to November and is a beautiful place / destination in winter with plants left standing, but Lincoln is pretty behind in this regard... have to go to Chicago or New York for that. I also had high hopes for Union Plaza on O Street, but that's a tepid bust. I listened about new impatiens that are drought tolerant, so are great for a Nebraska garden. Then care for elephant ears. Lily of the valley. Hosta. My god -- the same old plants we've been using forever that ain't gonna help any native wildlife. The Sunken Gardens teaches people that flamboyant beauty must be maintained all the time with lots of water and fertilizer and switching out plants and soil amending and work work work then toss money at it like rice at a wedding (don't toss rice, please). Gardens are not plastic art -- they are living ecology, a dynamic nexus where we meet the world we depend upon. The Sunken Garden's lesson is that nature is primarily an aesthetic painting to be placed on a romantic, 19th century pastoral pedestal and enjoyed for human purposes only in a very momentary way. I'm tired of this frankly outdated perception of what gardens are, a perception that's led to a lot of environmental trouble, but lots of people like it. I just wish we had the other side of the coin represented in Lincoln -- and we don't. Do we? Where? Please don't say the monoculture beds of Union Plaza where milkweed and chokeberry are evenly spaced in neat rows. As for next year's "Thunderbird" theme at the garden, I immediately got concerned when I heard talk about Native American design. Which tribe? What symbols? What meanings do those symbols have to that tribe's culture? Will you teach the public? Did you consult with any Native Americans? I heard a very reductionist, white-romantic conversation about using red, yellow, and white colors and zigzag / diamond designs. I hope this won't be yet another disservice to the cultures we pushed to the brink (if you're picking up on a link between human and animal / insect cultures and the relation between how we treat both, then we're on the same page). Our public gardens need to think more on multiple levels -- I just don't see it happening in my city. Last August I was a part of Ignite Lincoln and had 5 minutes to spout off on my hope to re-prairie the city. Watch me go in front of 600 folks -- and say with me that "milkweed is not a weed!" I have to admit, it was hard to say everything I wanted to in five minutes, and the breathless pace kept me on my toes. And oh, the bright spotlight. If anyone out there is looking for a speaker I'm wanting to do more. I've already got three dates lined up for next year, working on two more. Also working on a book that informs everything I talk about. So if you're a garden club, conference, botanic garden, nursing home, garden nursery, I can tailor my message and vibe to any audience. Such a nice, long fall -- perhaps the best fall of the 10 years I've lived here in Nebraska. A week ago Monday it was 65, then two days later single digits. That's how seasons seem to work here -- either on or off, hardly a nice easing into. In 2012 summer came in March. In 2013 we had snow on May 1. All I know is that I'm thankful for the full measure of each season, the extremes that test my endurance and humanity, that reconnect me to place and planet and home. I am more alive for the extremes, more able to find an equilibrium in my own nature. A simple message on the day of our first snowfall (4"). Prairie seeds are being stratified -- made ready to heal the world next summer. It's not too late to seed. It's never too late to stand up and fight for our home. If you follow me on this blog's Facebook page you probably don't need to read on, but I know lots of folks are blog-only readers. After a piece on Garden Rant I decided to clarify some points about native plant gardening. Tell me what you think about my ramblings. 1. I do not believe in 100% native plant gardens because I'm trying to re-establish some pre-colonial virginity. That can never happen. 2. I see so few native plants in ANY landscape, commercial or residential, that I know there's a crisis of imagination and connection to local environment. 3. I see so few native plants in local and big box nurseries that I know "...."
4. Without native plants we don't know our home ground, we aren't nearly as connected to place, and we won't see nearly the wildlife and support nearly the same number. It's called co-evolution. A sulphur doesn't lay eggs on hosta. Also, if you live in Arizona you can't have a cottage garden; if you want a cottage garden move to the PNW or the Northeast. 5. We MUST get away from a purely aesthetic value judgement of gardens. Often, we CAN have our cake and eat it too, but we need to accept and understand the benefit of plants going dormant, of a "messy" winter garden, of native grass lawns that don't green up in April, et cetera. Right now bee larvae are resting in the hollow stems of my "unkempt" joe pye weed, which also has birds perched atop it. 6. We need to stop gardening solely for ourselves and see the incredible, beautiful, soul-magnifying existence that happens when we open up our gardens to the rest of the local environment by using native plants. We believe in giving to the needy and poor of our own species, and to other causes near our hearts, why not the birds, insect pollinators, amphibians right out back in the gardens we supposedly cherish so much? Again, if monarchs are on the brink, what ELSE is on the brink? Planting an exotic plant is almost always a space waster. Out here in the Plains it's been proven that strips and buffers of prairie around ag fields increases crop pollination and yield (not to mention cleans up most ag chemical runoff). And insects feed how many song bird chicks? 100%? We need to be gardening for insects as much if not more than ourselves. 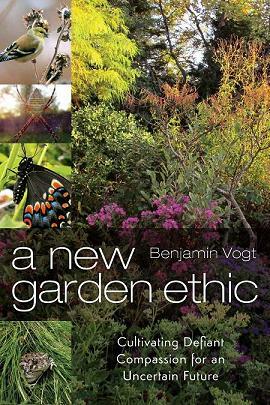 We talk about veg gardening as this holistic, green, wonderful thing to do for the planet -- but why don't we ever talk about ornamental gardening for insects and larvae? We garden for butterflies (too often with butterfly bush), but we don't garden with the plants they evolved with to eat. But it's constraining to use plants native to your locale? 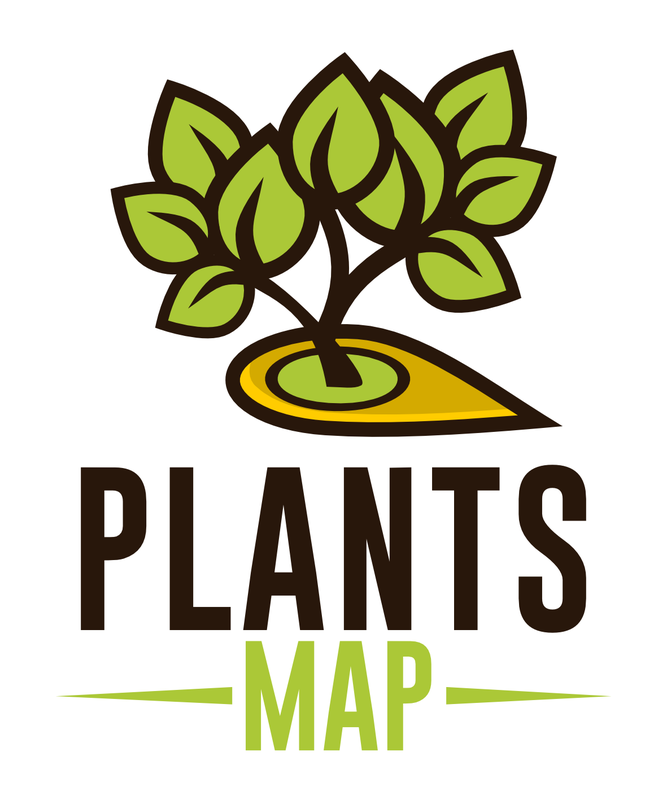 Do you even know which plants are native to where you live? That's constraining -- short-sighted, too. Let's talk about good garden design in general for a moment -- or any art for that matter. It's the "constraint" that makes the art / artifice that much more powerful (I say this as a poet and writer). It's the coloring within the lines, and coloring in a new way, that makes the design pop and sing and move and hit us deep. If you have a garden palette awash in a plethora of plants you have visual chaos -- but even a prairie, so often seen as chaotic, is governed by rules; those rules make the display that much more emotionally impacting and able to teach us something about what's there. Native plants aren't limiting or constraining -- your willingness to embrace any exotic will, in the end, limit and constrain my health as ecosystems that have worked for thousands of years collapse (insects!). This is why we have invasive species lists. We know what we're doing. We do it anyway. Stop making excuses. Learn your world. Stop looking at your navel. Native plants go to the heart of our moral and ethical alert systems that tell us when something is wrong or right -- but we work even harder to deny those alert systems, ignore them, in favor of personal and immediate gratification at the expense of the future. Our future. A more peaceful future with no wars over clean water and fossil fuels, a future with less cancer and birth defects and learning disorders caused my chemical elixirs in our food, water, and air. Native plants are the top of a much larger iceberg and represent more than aesthetic getaway value. And maybe that's the problem, too -- talking about gardens as not just a sublime refuge from trouble but the heart of trouble, a reflection of larger issues we CAN change, is uncomfortable, and it should be. We don't want our gardens to be statements for anything but personal pleasure. We don't want our gardens to be influenced by the world out there. Our gardens are not insular little worlds, though, especially in suburbia. Gardens and managed landscapes are not just for us, to assume they are is racism toward other species. And even genocide. Case in point -- corn and monarchs. If you think I'm politicizing native plants then that's because the apparent debate over using them reflects issues of race, class, and even gender. Those who are poorest suffer the worst health and food options -- even in our own country. And one could say the poorest of the poor might be other species who have no defenders other than idealistic humans. We get sad when black rhinos vanish and polar bears drown looking for any ice drift to hunt from, but it's hard to look at the same things going on out the back door. But we need to look. It's all connected. I was walking down some prairie wagon trail, legs tired. From behind came two dirty men with soiled clothes and mangy beards in a wagon taller than me. In the wagon was a huge white female bison, head severed from the body. The wagon lurched and seemed about to fall apart under her weight. They offered me a ride and I could barely stomach it, but I knew I could not go on walking. They talked about the hunt, how hard she was to catch and shoot. They talked about how the head would fetch quite a price in town. When we made it to a small outpost I thanked them for the ride and, without anyone noticing, apologized to the bison carcass, crying. I ran as quick as I could up a nearby embankment covered in carrots and strawberries that I picked as I ran. My dog followed, wanting to stop to chat with women picking the harvest but I called it along as I tripped, struggled to run across a now open plain to the horizon. I was desperate to be alone and see the prairie one more time. I'm always conflicted -- is mid July the best time in the garden, early October, or mid November? All three have their charm -- no, orgasmic appeal. The trick is to deeply appreciate all three, just as I hope we all can find pleasure in each distinct season. It's amazing how just two weeks ago there was lush fall color, with bright rainbows strewn about like confetti. Yesterday it was 61 and sunny, today icy with a windchill of 10. Come winter. Be deep and cold and give my full measure, because autumn has been the finest dessert to a long garden year and spring is something I must suffer toward. For a while we inhabit our bodies, fill them with signals of our being -- colors and scents, desires and actions, calls out into the abyss until a few find us and we become one. We are like the coneflower, a ray of inflorescence, stamens sticky with faith. We fade. We get sharp. We get stuck to whatever passes by. We're carried out into the autumn and like ghosts some part of us surfaces far away. Again and again, over and over, our shadows echo and call back to one another. Where will we bloom again. Will we ever bloom again. Or is this moment the only one and we must live it hard enough to last a hundred lifetimes. This is the prairie inside of us. We are prairie. I read too many articles that just really fire me up, get me angry -- piss me off (better off than on?). It always frustrates me when people say we need more corn fields to feed the world. First, the majority of corn goes to make ethanol. Second, corn is used to quickly stuff cattle in finishing lots, making the meat fattier and a leading contributor to human heart disease. Third, we already waste something like 50% of the food we have due to spoilage at home or in the grocery store or in transport from half a world away. "This expansion of the Corn Belt is fueled in part by America's green energy policy, which requires oil companies to blend billions of gallons of corn ethanol into their gasoline. In 2010, fuel became the No. 1 use for corn in America, a title it held in 2011 and 2012 and narrowly lost this year. That helps keep prices high." "What the green-energy program has made profitable, however, is far from green. A policy intended to reduce global warming is encouraging a farming practice that actually could worsen it. That's because plowing into untouched grassland releases carbon dioxide that has been naturally locked in the soil. It also increases erosion and requires farmers to use fertilizers and other industrial chemicals. In turn, that destroys native plants and wipes out wildlife habitats." "It appeared so damaging that scientists warned that America's corn-for-ethanol policy would fail as an anti-global warming strategy if too many farmers plowed over virgin land.The Obama administration argued that would not happen. But the administration didn't set up a way to monitor whether it actually happened. It did. More than 1.2 million acres of grassland have been lost since the federal government required that gasoline be blended with increasing amounts of ethanol, an Associated Press analysis of satellite data found. Plots that were wild grass or pastureland seven years ago are now corn and soybean fields. That's in addition to the 5 million acres of farmland that had been aside for conservation - more than Yellowstone, Everglades and Yosemite National Parks combined - that have vanished since Obama took office." "Nebraska has lost at least 830,000 acres of grassland, a total larger than New York City, Los Angeles and Dallas combined." "...much of the land being converted is not suited to crop production, and South Dakota's strong winds and rains will erode the topsoil." And so I feel a moral imperative to cash out all I own, buy as much land as I can, and seed the crap out of it with prairie. And this is also why you should use as many native plants out your door as you can -- not because you're helping preserve prairie or their ecosystems, but because you're aware of the power of prairie, ready to learn more about it, saying to your neighbors this is not who we have to be, we can be better. Soon enough this blog will enter its winter period -- which this year will mean garden and environmental manifestos as I work on a new book. But before those rants and deep ecology posts, let us gorge ourselves on one fantastic fall in the garden. Let me know what you think. The colors will run well into the end of the month -- it's a nice 2 month long show here in Nebraska! This is my vision for the 21st century garden -- a space that embraces both the aesthetic /artistic expression of the creator / owner, and that pays attention to the local ecology by creating as much of a native wildlife habitat as possible. I do not see ecology and garden design as mutually exclusive or in any way opposed to one another. Yes, this means gardening may tax our brains a bit more, and nurseries and architects and landscapers will have to educate more. But you know what? I'm seeing a true hunger for that education in every talk I give, in every consult I do. Sure, using native plants is not a silver bullet, so please don't you dare tag me with a "purist" label; gardens can never be true representations of local, native ecology because they are artifice and are too small-scale to do much on their own. But our landscapes do link up and create park corridors -- it's the whole idea behind lawns in suburbia. What if those lawns were forests, shurblands, or prairies? Yes, they might never be able to function indepentently like "wild" ecosystems, but they'd still provide for a far greater diversity of wildlife and mitigate our pollution, runnoff, help on electric bills, etc. I see a wildlife corridor just in the thin tree line that goes along my back property. When I hear someone say we should just let gardeners be, let folks do whatever they want, I feel pretty aggravated. The status quo is what's gotten us into the whole mess of climate change and ecosystem fragmentation, dirty air, dirty water, asthma, and perhaps ADHD and a host of other environmentally-induced illnesses. Let's hook gardeners on native plants that amend the life in the soil and in the air. It's easy. Everyone wants to see more butterflies and birds. So let's go with viburnum, serviceberry, milkweed, liatris, ironweed, etc. Plant a few of those in a landscape and suddenly the human residents notice something special, start thinking, start connecting the dots, start reading and learning, and then do more. They become wildlife refuge managers without even knowing it. Bam. Citizen scientists. Cool people. Stewards. Important activists. You can't plant whatever you want anymore. I'm not saying we need a plant police, but you also can't just dump used paint or fluorescent lights out back either, can you? Let people be? Foster the ignorance is bliss theory? Nah. Not for me. We can use native plants in any landscape design, but it does require more upfront thinking and planning; you can't just call 1-800-landscaper and have them plop in the standard fare of spiraea, barberry, miscanthus, and some doomed annuals. Waste of money. No benefit to wildlife or local ecology. The fact that we are killing off 6,000 species a year and spilling oil all over the place is a sad, depressing fact. But the bigger fact is we don't have to -- we know the better alternatives, and not pursuing them is a clear moral / ethical imperative we are failing with gusto. If you are depressed by the reality of what we do to the planet, then sticking your head in the sand and hoping for the best -- or pleading to just let gardeners do whatever makes them happy -- won't fix a thing. What will fix a thing and bring you true joy is planting native plants, getting to know your local ecosystems and species, and setting an example in your neighborhood by ripping out lawn maintained by gasoline, fertilizer, and clean water. Every gardener has immense power -- and the joy produced by the larger amount of wildlife your native plants attract will far outstrip the pretend, plastic joy of just doing whatever you want (like planting nonnative crap from big box stores). 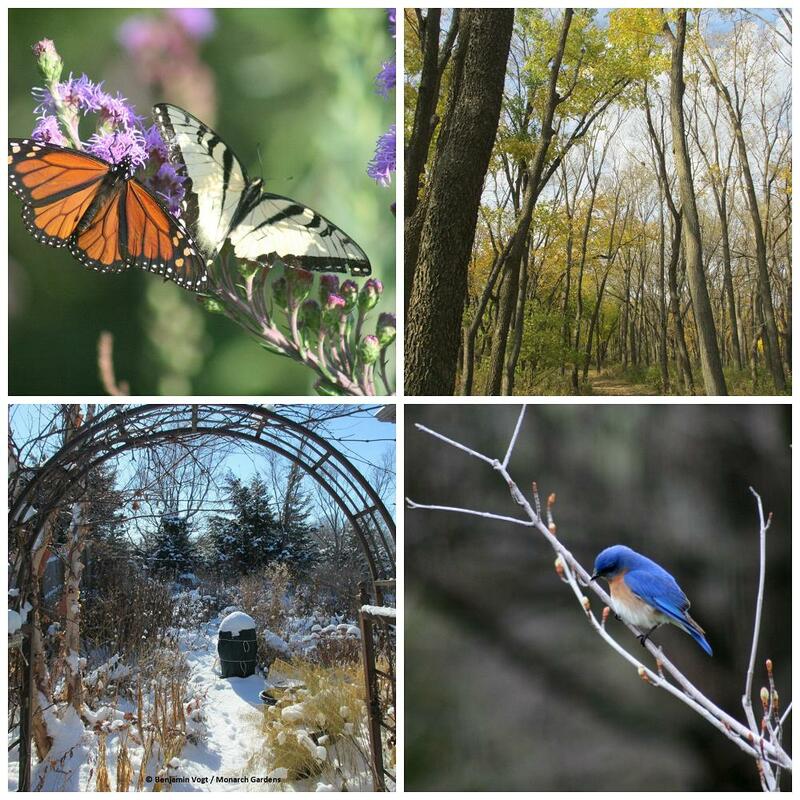 Two great pieces this week that speak more specifically about the above aspects can be found via Chris Helzer (The Conservation Value of Backyard Prairies) and Thomas Rainer (Mingle or Clump). This fall I've become particularly enamored with one path, one portion in my small garden. I think it may be two asters that I self sowed themselves -- I just don't remember planting them. They are growing into blue sentinels across from each other on this one path, covered in insects, glowing in four dimensions. This is what I like about a garden that's now wilding -- I can be surprised year to year and take deep pleasure in the angles of light, the new reflections of life, the shifting form and function of even one small area. I'm not the only "crazy" one linking morality and ethics to nature and landscapes (I've known this for some time, though). I just finished Rambunctious Garden by Emma Marris, and while I spent most of the book pissed off both by some things she was saying and how she was saying them, by the time I got toward the end I realized we had similar goals. It doesn't hurt that she uses Aldo Leopold to get her point across more than once. "In the late 1940s conservation icon Aldo Leopold called the recognition of the inherent value of an ecosystem a land ethic. The land ethic extends to 'soils, waters, plants and animals' the same moral obligations we currently have to members of our human communities.... In modern terms, the land ethic espouses a biocentric view of life, which gives other species and ecosystems moral status." She goes on to discuss deep ecology and philosopher Arne Naess. Shallow ecology is looking after the earth as an extension of looking after the self. But in deep ecology all living things have value simply because they are. Humans are not especially priveleged but are nodes in a complex web. Taking care of ourselves means taking care of the environment. Deep ecology sounds a lot like taking care of those you love, and those you don't know who are less fortunate, except we now extend this to other lives beyond our own species. I'm not sure why this is so hard to grasp or practice. Leopold and deep ecology are things I've studied, but so long ago I let them slip away. Suddenly, in a few lines, Marris shows me that these writings had a profound effect on how I view the world and define my work. "Rich westerners, especially, must quit tapping into nature at such a furious pace to satisfy the frivolous desires of their consumer society. Human beings must reduce their population so that we can live more lightly on the Earth. These are all moral obligations to the natural world, not mere choices." "We are used to the idea that individual lives are fundamentally valuable; it is the basis of the sense that murder is wrong. It is harder to set values for morphous collectons like 'ecosystems' or 'the land' or for nonliving entities like 'the soil' or a stream. Some ethicists, however, certainly hold that these entities have their own intrinsic value. Some even propose that the entire Earth itself holds value as a single human does...."
She goes on to say losing native plants and ecosystems is like losing a language, a culture. Yup. Hell yup. The last few days I've been dividing and planting out milkweed seedlings that I winter sowed last year; they've grown into healthy young plants this whole summer. I was able to get about a half dozen common milkweed, and maybe a dozen swamp milkweed. Asclepias incarnata has great fall color! Every day I read an article about the 80% drop in numbers of last winter's monarch population in Mexico, and then a 90% drop in the North America summer population this year. You've got logging in Mexico, spraying glyphosate in agricultural fields of the Plains and Midwest, roads and cities, less wild flowers to nectar on, less milkweed to lay eggs on. This is a species potentially on the brink in most of the U.S. and Canada, but it's one of many thousands more we don't see as commonly, that isn't as big and bright or as enchanting for most folks to watch as it flits through the air. We are a nation of 40 million gardeners -- we have immense power to do the right thing, and there is a right thing to be done. Plant milkweed. Not one. Not two. But a dozen right out your door. Rip up more lawn and put in a native flower bed rich with nectar. Toss in more milkweed there. We are directly causing climate change, we are directly eroding habitat through ag subsidies and suburban sprawl and mining and tar sands and marsh draining. Those are huge, sprawling issues we can't tackle alone -- but with collective small acts we can erode the physical and psychological damage. Every milkweed planted is a blow against our worst selves. We are eradicating a species' home -- it's not the monarch's, it's ours. And the root of the entire issue is that we see ourselves disconnected from life. We are self centered, whether as a product of our evolution or our culture or both. It's not a completely bad thing to be self serving and aware. A lot of you reading this blog garden -- you know what happens when you sit in the garden and watch a bee or butterfly or bird for 10, 20, 30 minutes. You know we aren't disconnected. Maybe that's transcendence, maybe it's pure love, maybe it's just being human and embracing wonder on a 1 to 1 level. Plant a milkweed and rewrite our ethical codes. Garden as selflessly as, in the most ideal times, you live selflessly for others you love. Garden for yourself. Garden inward. Garden for your own pleasure. Garden to bring in butterflies. Garden for milkweed. Garden for all that is seen and unseen. Garden for hope and faith in the planet that birthed us and allowed us to have these quandaries of crisis, doubt, and change. Plant a milkweed. Someday I'll have the garden of my dreams, but for now I'll have to live with this. I can manage. Cheating with Liatirs mucronata -- it's native to the southern Plains and so blooms later here. 2" of rain last week. Very nice. 27 lunch bags and counting. I figure I'll make it to 40. The plan is to winter sow as many species as I can (in pots and beds), and then, perhaps, use most of the seed to start a nursery business on an acreage next year. Maybe. For now, the kitchen table is serving prairie. 1) Between 1994 and 2004, an estimated average of 75,884 Americans each year were injured using lawn mowers, or roughly the same number of people injured by firearms. 2) Using a gas-powered leaf blower for half an hour creates as many polluting hydrocarbon emissions as driving a car 7,700 miles at a speed of 30mph. 3) Approximately 7 million birds die each year because of lawn-care pesticides (and that's just lawn care, not including shrubs, trees, flowers, or agriculture). 4) In the process of refueling lawn care equipment, Americans spill 17 million gallons of gas every summer, or 50% more oil than the Exxon Valdez spilled off of Alaska. 5) A single golf course in Tampa (Florida alone has over 1,000 courses) uses 178,800 gallons of water per day, enough to meet the daily fresh water needs of more than 2,200 Americans. 6) Lawn chemicals are tracked into the home often, where they build up in carpet, this placing small children, whose developing bodies are far more vulnerable to toxins, at risk of chronic exposure. This is the place my wife and I had our wedding reception six years ago, but last night we were at their annual festival. Spring Creek is a virgin tallgrass island in a sea of cash crops, still sporting wagon ruts from an Oregon Trail cutoff, over 800 acres in size about 7 miles due southwest of Lincoln, Nebraska. There are plans to connect this prairie and the one near our home in Pioneers Park with a prairie corridor -- hopefully this happens within the next decade or so.